Medical marijuana in Brookline: will there be a site? Article 12 at the November town meeting sought to exclude more Brookline territory from becoming sites for medical marijuana dispensaries, but the town meeting rejected all motions under that article. Zoning continues unchanged from a plan voted in November, 2013, and no new studies were authorized. 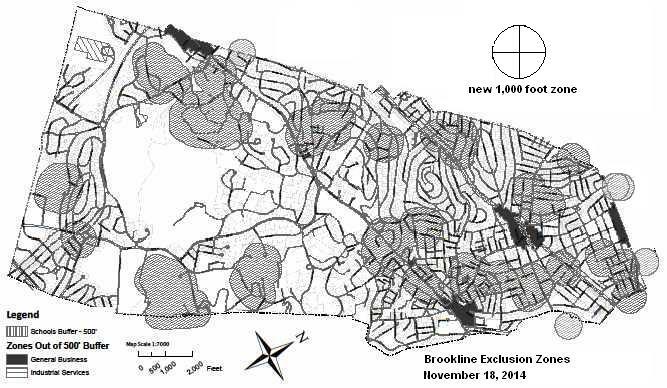 As required under state laws, Brookline has left a few areas of the town outside its exclusion zones, providing potentially eligible sites under local laws. On the map, Brookline’s eligible areas in general business zones are colored black. There is also an industrial zone, shown as hatched, near the waste transfer station off Newton St. The map prepared by the planning staff marks excluded areas, within 500 feet of both public and private schools. They are colored gray. Since Brookline has met its obligations through zoning, state regulations do not apply. However, the federal government, acting through district attorneys, may step in. In some of the later discussions over Article 12, proponents claimed the federal government would impose 1,000-foot exclusion zones around parks, playgrounds and public housing sites. The map shows a circle as an example, with a radius equivalent to 1,000 feet. The only mention of those arguments in town meeting documents was a brief statement from the Advisory Committee in the final warrant report. [Article 12, supplement 1, pp. 5-6] It drew no conclusions and cited no documentation, describing federal regulations as a business risk for dispensary operators. 1. The zone along Commonwealth Ave. near St. Paul St. might be blocked from Knyvet Square, the Egmont St. veterans housing and Trustman Apartments. 2. The Coolidge Corner zone along Beacon and Harvard Sts. might be blocked from the Devotion School and its playgrounds, the Beth Zion Hebrew school, Griggs Park and St. Mark’s Park. 3. The Brookline Village zone along Washington and Boylston Sts. might be blocked from the old Lincoln School, Lynch Recreation Center, Emerson Park, Boylston St. Playground, Juniper St. Playground and Walnut St. Apartments. 4. The zone along Boylston and Hammond Sts. might be blocked from the Soule Recreation Center, Brimmer and May School, Beaver Country Day School and Pine Manor College. 5. The industrial zone near the waste transfer station might be blocked from Skyline Park and the Lost Pond Reservation. Federal exclusions: As noted in a recent Boston Globe article, federal powers in these matters are exercised by the U.S. Department of Justice, acting through district attorneys. On August 29, 2013, Deputy Attorney General James M. Cole issued a “guidance” memorandum to U.S. attorneys. • revenue from the sale of marijuana from going to criminal enterprises…. • violence and the use of firearms…. • drugged driving and…other adverse public health consequences…. • growing of marijuana on public lands…. • marijuana possession or use on federal property. This entry was posted in Business, Grade schools, High school, History, Housing, Neighborhoods, Public health, Regulations, Services on December 7, 2014 by Craig Bolon.